A collection of essays that will make you laugh out loud! 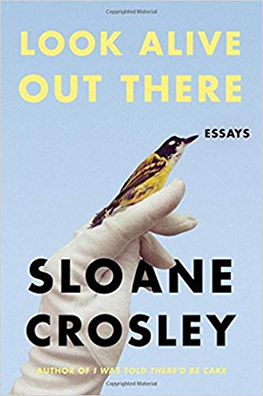 Sloane Crosley delivers in Look Alive Out There―a brand-new collection of essays filled with hilarity, wit, and charm. The characteristic heart and punch-packing observations are back, but with a newfound coat of maturity. Sloane Crosley’s life is a series of relatable misadventures. Crosley continues to rise to the occasion with unmatchable nerve and great one-liners. Her subjects become more serious, and her essays deliver laughs and lasting emotional heft and insight. A book of hilarious and witty essays that makes you laugh out loud. Find more like this out in the Popular Reading Collection!